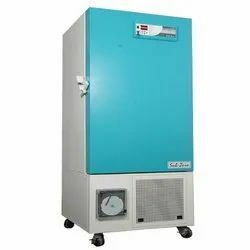 Leading Manufacturer of ultra low temperature cabinets, laboratory freezers, laboratory deep freezers, cooling cabinets and laboratory bio freezers from Chennai. With the endorsement of our adept and seasoned professionals, we are engaged in offering a commendable range of Ultra Low Temperature Cabinets. The structure of the cabinet is based on two time foaming technique to ensure protection against extremely low temperatures. These cabinets are upright and have door just like conventional household refrigerator. Our respected customers can avail these cabinets on numerous specifications according to the demands of customers. Using reliable components to ensure quality. Micro-controller based controlling and monitoring. With built-in rechargeable Battery backup for display and alarm function’s. Intelligent time delay for dual stage controlling. Door mounted control panel on eye-level location in upright model. Dual display for reading actual and set temperature simultaneously, lower display indicates functions and errors. Set point security system with key operated switch. Do it yourself Washable Filter for Protection of condenser fins. Reliable hot gas heated door frame prevents ice build-up in door opening. Aerodynamically designed condenser provides efficient cooling system. Safety functions for refrigeration system are provided. Heavy –duty castor wheels for easy mobility with locks. Industrial applications on epoxy materials, polymeric products, QC studies, production materials and Sub-zero heat treatment. 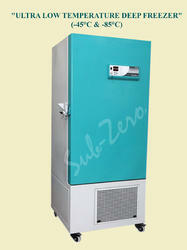 Low temperature freezer vertical type is a freezer designed to handle extremely low temperatures. They are upright and have door just like conventional household refrigerator. The structure of the freezer is based on two time foaming technique to ensure protection against extremely low temperatures. Facilitated by a technically advanced process, we are presenting a distinguished collection of Laboratory Freezers. Our provided laboratory freezers are featuring advanced control systems and alarms for use in a variety of life science, clinical and industrial applications Low power consumption, bright red led display and micro-controller based system are some of the remarkable features of our range. Also, offered laboratory freezer is tested by our quality controllers against diverse parameters so as to dispatch a defect-free range. Lab Freezer featuring advanced control systems and alarms for use in a variety of life science, clinical and industrial applications. Designed for storing critical materials that demand constant temperature and security. 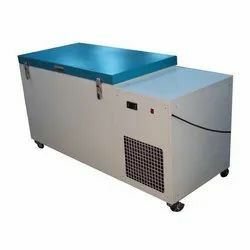 Deep Freezer -80 is specially designed for Blood Banks, Research Institutes, and Biotechnology Firms for storage of multiple components of the plasma within the prescribed temperatures(-80). This is ensured using the unique expansion valve technology developed by our experts. With our long and wealthy expertise within the field, we tend to provide a large variety of Cooling Cabinets to our valuable shoppers. Our professionals have used latest technologies within the production method and these merchandises are offered with high potency mechanical device cooling systems. Riding on unfathomable volumes of industrial expertise, we are presenting an exclusive array of Laboratory Bio Freezers that is specially designed for preserving the food, chemical and many other allied products. 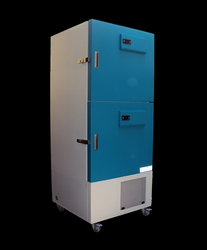 This bio freezer provides an ideal freezing environment for advanced medical and industrial applications. Our bio freezer is provided in several specifications, as per the requirements of clients. This bio freezer can be availed at industry leading price within a confined time frame. Looking for Low Temperature Freezers and Cabinets ?